TORONTO—Last month, representatives from around the globe gathered in Cochabamba, Bolivia for the first World Peoples Conference on Climate Change and the Rights of Mother Earth. 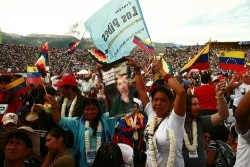 Called by Bolivian President Evo Morales in the wake of last winter’s Copenhagen United Nations Summit, he called “the peoples of the world, social movements and Mother Earth's defenders,” to gather for a People’s Summit. The conference captured popular sentiment, ballooning from an expected 5,000 participants to well over 30,000 from over 140 countries. This compares with around 40,000 participants to the Copenhagen summit, although "civil society" only made up half that number—making it the largest gathering of non-governmental voices on climate change. High-level delegations also came from Ecuador, Venezuela, Peru and Cuba, with representatives of 40 other governments present. Crucially, however, talks were led by those in attendance, not by governments. This was a sharp distinction from any UN processes, where civil society and Indigenous Peoples must often fight to be heard, let alone have their input respected. This meant that those voices had not only the opportunity to talk climate justice; they had the ability to challenge the terms of the traditional climate debate and put forth radically different solutions. These are reflections from Canadians who attended the summit in various capacities. I was invited to sit as Secretary of the Indigenous Peoples Working Group, one of 17 distinct working groups. In all of the working groups, we built upon an online discussion process that had started weeks before, and involved people who couldn’t make it to the conference. In all the working groups, Indigenous peoples from South America were prominent, which gave a particular flavour to the documents and discussions. This was evident in the discussions that pushed for a return to principles of "living well," granting rights to nature, and building upon long-ranging debates about interculturalism—beyond laissez-faire liberal multiculturalism—while ensuring that these ideas found a receptive audience in the global climate justice community. After prolonged debate on the various issues, our job as secretaries was to come up with a final text from each working group. Eventually, the results of each working group were consolidated into one final text, which was presented to a crowd of tens of thousands on the final day of the conference. Indigenous peoples called for transnational corporations to be banned from Indigenous lands, while calling for the universal application of the United Nations (UN) Declaration on the Rights of Indigenous Peoples, not only as a protective measure for the climate, but also against the negative impacts of any climate "mitigation" projects, such as biofuels or mega-dams, which have already devastated many Indigenous communities. Indigenous groups also made a call for people to "live well" instead of seeking unimpeded economic growth. In the end, the participants made a call to developed countries to reduce emissions by 50 per cent within the next decade, while paying off the ecological debt owed to the countries and peoples most impacted by climate change. Also noteworthy was the development of the Universal Declaration on the Rights of Mother Earth, which attempts to articulate a new class of rights towards the non-human world. This compliments the proposal to form an International Climate Justice Tribunal that would be empowered to prosecute countries and companies who violate environmental agreements. Key ideas articulated in this Universal Declaration, already forwarded to the UN by the Bolivian government, include granting Mother Earth and her dependent beings the rights to life, to water, to be free of contamination and genetic modification, while laying out complimentary obligations for humanity. Participants also issued a rejection of carbon markets as a neo-liberal means of avoiding real emissions cuts, while privatizing the planet. Understanding these projects as a way to impose devastating mega-projects on many local communities, they soundly condemned the UN proposals on Reducing Emissions from Deforestation and Degradation (REDD) as another mechanism that threatens to privatize and rob Indigenous peoples of their land, while letting developed countries off the hook. Despite all the powerful words, the conference still faced a number of challenges, starting with an unruly volcano in Europe that kept many participants from attending. Timelines were short, resources were sparse, and sufficiently large meeting rooms far too uncommon. 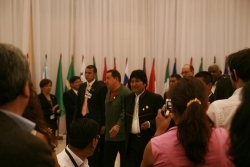 Three presidents even had to stay home because of domestic issues, leaving only Morales, Hugo Chavez and Esteban Lazo Hernandez, vice-president of Cuba, to attend. The challenges internationally stemmed from the lack of attention paid to the conference by the international press, except to an out-of-context statement by Morales on the potential effects of growth hormones in poultry on male sexuality, for which he was ridiculed to no end. Otherwise, the conference was a media black hole outside of South America, with Canadian press not even showing up to a joint press conference organized in Ottawa during the conference. In the long term, the challenge will be to use the momentum and strategies fostered at this conference to build and strengthen local movements worldwide, and force real change in government and non-governmental institutions. The other challenge is to translate and communicate the conclusions of this historic conference into local contexts and strategies. Here in Canada, reports have taken place and are planned for different communities. But it will not be enough—movements and organizations in Canada and abroad must make the space for the voices from the South to inform and lead. The mobilization towards the G8/G20 in Toronto and the US Social Forum in Detroit cannot miss this important opportunity to advance the case for climate justice and build the connections between peoples and movements to challenge Canadian governments and corporations. With only six months remaining until the Cancun Climate Conference, we have a chance to see if we’ve learned anything since Copenhagen. When I think back to Cochabamba, there’s one afternoon I remember. Surrounded by Indigenous families, it was very different from any conference I’d been to before, where the only "civil society" present are representatives from NGOs, civil servants and union leaders. The vast majority of people in Cochabamba were community members—individuals and families whose livelihoods are deeply threatened by the climate crisis. They weren’t speaking about someone else’s struggle, but their own—a vast contrast from the typical climate conference, and this influenced the type of discussions that were had. What I learned in those few hours was far more valuable than anything a scientific report could tell me. In Cochabamba, I heard story after story of people’s direct knowledge and experience with climate change—droughts have ruined harvests for poor farmers; floods have displaced families; melting glaciers have led to extreme water shortages in major cities—it was all right in their backyards. People were telling their own stories as evidence of how climate change has exacerbated poverty, illness and displacement for their communities. As I listened to people’s interventions, I realized how different the discourse in Canada is. Our arguments for climate action are mostly based on science and scary predictions about a looming future, because many of us are not personally impacted by the climate crisis yet. We use numbers and statistics as evidence that we have an unprecedented crisis on our hands, but we just end up confusing Canadians along the way. There was also a common thread in people’s stories that afternoon—of the extreme air, land and water pollution, health impacts, and military presence of mining industries forcefully setting up shop in their communities. The connection between the extractive industries and the creation of the climate crisis was seamless, as were the links to the global capitalist system, which has allowed unregulated resource extraction to ravage the people's land, their health, their way of life and their self-determination as Indigenous peoples—all this in the name of unfettered profit for the global North. That afternoon I realized, maybe we—the Canadian climate movement—have been asking ourselves the wrong questions. We have been so focused on how to "fix" climate change that we haven’t spent enough time asking ourselves, what caused such an unprecedented catastrophe to begin with? Is the way that we frame the issues and solutions in Canada only validating the existing capitalist system that has caused the climate crisis? Are we even educated enough to know the difference between false solutions that perpetuate human inequality and ecological destruction, and the real, just solutions expressed in the People’s Declaration from Cochabamba? How often do we talk about the depth of systematic change that is needed to overcome this crisis? It is time that the climate movement in Canada better aligns itself with the demands of the growing resistance in the global South. The Climate Change Accountability Act has passed its third reading—an amazing victory—but the hard work comes as we determine how Canada will achieve these targets. Moving forward, we have to question how each of our actions and strategies fit into a larger struggle—restructuring our relationships, our jobs, our economy and our production and consumption of goods. Each small victory should be one step closer to transforming the overarching systems we wish to change. Each victory should bring us one step closer to the paradigm shift that we envision as a movement. If we are committed to climate justice, then we are committing ourselves to challenging current global systems that continue to exploit, oppress and kill. We are committed to standing in solidarity with communities on the front lines of this struggle. We are committed to spreading the real solutions articulated in the People’s Declaration with our families, our peers, our communities and our politicians. The world has spoken in Cochabamba and it’s time to heed the call. As we mobilize toward the Toronto G20 this month, followed by the UN climate conference in Cancun, Mexico, in November, we will see if the voices of the global civil society, so beautifully articulated in the People’s Declaration, will be heard by the world’s biggest powers and polluters. Kimia Ghomeshi is an Iranian-Canadian based in Toronto. She works as the G20 Campaign Co-ordinator for the Canadian Youth Climate Coalition. Ben Powless is a student at Carleton University in Ottawa, and works as a climate justice campaigner with the Indigenous Environmental Network in Ottawa.